▪ Gain consensus on economic development direction across the County. ▪ Address the economic differences between the northern and southern parts of the County. ▪ Identify solutions for specific issues that are barriers to economic growth and development. ▪ Optimize distinctive Moore County assets. ▪ Explore ways to diversify and grow the tax base. ▪ Develop a work plan with relevant metrics to drive economic development. The following Vision was created as part of the Plan: To be a national leader in growing a well-diversified county economy — proud of our rural heritage — recognized as a destination with world-class amenities, and for preserving our unique Moore County charm. 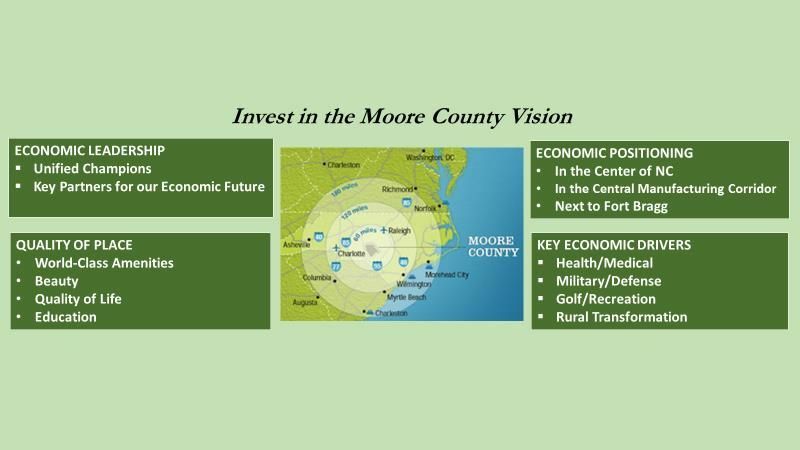 This Vision aligns with Partners in Progress’ economic development mission to increase economic prosperity and improve the quality of life for Moore County’s citizens through the creation of quality jobs and capital investment in our communities. 5) Rural Transformation: developing opportunities in Moore County’s rural and distressed communities through town revitalization/beautification, business enterprise, tourism, and agribusiness. The 44-page Strategic Plan provides recommendations for addressing the issues outlined in the bullet points above. Seven (7) goals are identified with specific strategies for achieving each goal, and an action matrix for implementing the plan is outlined. A 2-page Capsule Summary of the Plan can be accessed here.